1. You can use the end of the pump handle as a tamper. Tamping the grounds improves the quality of the extraction. 2. In order to get the best result in the cup, choose fresh coffee that you grind 3 minutes before brewing your espresso. 3. Preheat the water reservoir with hot water. Then fill the water tank once again with hot water and add the ground coffee or the pod. We can add that it's a good idea to preheat the cups, namely if they are made of glass or china. 4. Once the portafilter is on, flip the machine over and wait for at least 5 seconds before pressing the brew button down. This is to pre-wet, in order to saturate the coffee grounds before brewing. You'll get the best result this way. 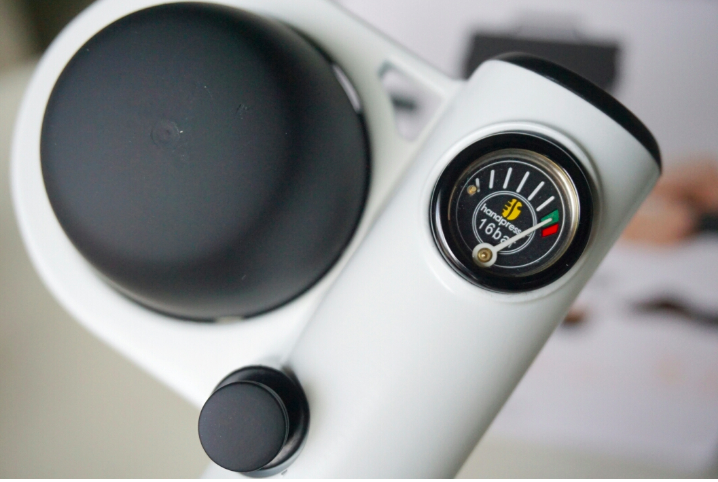 "Very pleased with Handpresso from built quality to espresso quality... the Handpresso delivers decent quality espresso if you know how to use if correctly. As always, patience is key here when we talk about making a good espresso. I would recommend Handpresso to anyone looking for a quality espresso on the go. I am sure you will be satisfied with the quality of espresso it delivers. ANYWHERE!" 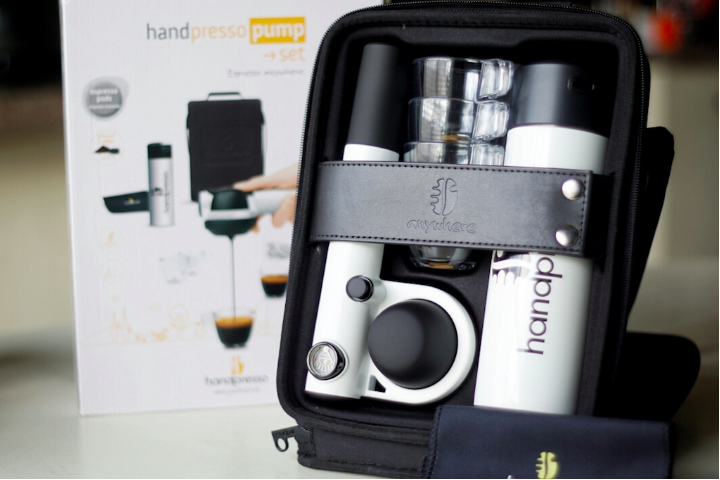 Since it was put on the market in early 2008, the Handpresso Pump launched the concept of espresso on-the-go. This handy coffee maker revolutionized the coffee world. It has become the flagship of the company. The premium and iconic version comes in 3 colors: black (the original), silver and white (Coffeesphere's version). Robust and compact, the Handpresso Pump travels with you outdoors, anywhere really! It is meant for all coffee lovers on-the-go. Eco-friendly, using no battery and no electricity, it will appeal to those who care for the planet. For all of you who want to share your coffee break wherever you are, then the full set is the answer. It is a beautifully-designed bag containing it all, the machine and the thermos-insulated bottle in the same color serving 4 or 5 cups as well as 4 unbreakable cups and a napkin.